Heart attacks are a very common medical occurrence. This is the reason why we encourage you to become certified in CPR and to know that every second counts when it comes to saving a heart attack victim. Someone has a heart attack nearly every 20 seconds. Someone dies of a heart attack once per minute. Women under the age of 50 have twice the mortality of men the same age after a heart attack – largely because women take two- to four times longer to respond to heart attack signs and symptoms. Heart attacks are most likely to take place on Monday mornings; Saturday mornings rank second, and the third-most likely time to have a heart attack is in the early evening when blood platelets are stickier. When you consider the facts, it makes sense for people of all ages to recognize the signs and symptoms of a heart attack. This includes knowing what to do if you suspect someone is having a heart attack. Hollywood has tricked us into believing people having heart attacks go from laughing at a party, to an abrupt, chest-clutching heart attack episode. In real life, heart attacks are rarely that sudden. They often creep up on the victim, via a series of recognizable signs and symptoms, which can occur when someone is active, or at rest. If the individual, or someone nearby, pays attention their quick action could save a life. Chest pain or discomfort. Don’t be mistaken into thinking that chest discomfort or pain is dramatic. While it can be very sharp or distinct, the chest discomfort associated with heart attacks can also feel like intense pressure or fullness, or a distinct, squeezing sensation. These feelings may last a short or long time, and they often come and go. Unusual pain or discomfort in the upper-body. Inadequate blood supply can cause nerve pathways to signal pain or discomfort outside of the heart. This can lead to uncomfortable feelings in the upper-body, including the jaw and/or teeth, the neck, in the left OR right arm, shoulder and upper back and the upper abdomen. Stomach discomfort. Heart attacks can signal themselves via stomach or abdominal discomfort, pressure or indigestion, as well as nausea or vomiting. Shortness of breath. 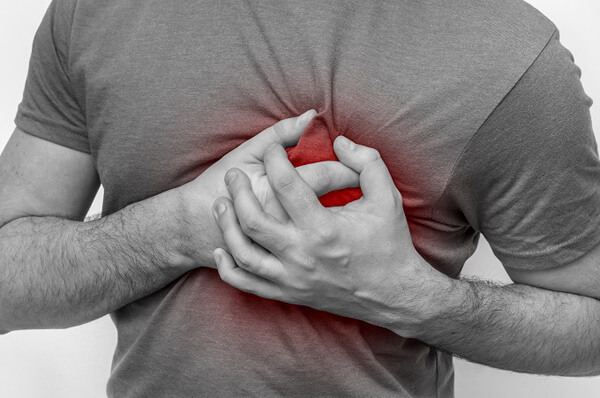 Often, victims of a heart attack report being short of breath “for no reason,” and this may or may not be accompanied by chest discomfort. Dizziness, lightheadedness and/or fainting. Lack of blood supply and oxygenation of brain cells leads to dizziness, lightheadedness and/or fainting. It’s also important to note that while women may experience chest discomfort, they are more likely than men to experience stomach upset, dizziness and light-headed feelings, upper-back pressure or extreme fatigue. This is part of the reason why women often have symptoms for 2- to 4 times longer than men before seeking medical attention. One of the most common quotes from women who’ve had heart attacks is, “I just thought I had the flu…”. If you notice symptoms of a heart attack, call 9-1-1 immediately. People often hesitate to do so because they’re worried it might not be a heart attack after all and that it will cause embarrassment. There is also the “it can’t happen to me…” syndrome. With 1-in-4 U.S. deaths related to heart disease, it certainly can happen to you even if you’re otherwise fit, healthy and active. First-responders, EMTs and medical professionals can all attest they’d much rather establish you’re not having a heart attack than to find out you didn’t receive the medical attention you needed because you were embarrassed or afraid of causing a fuss. Calling 9-1-1 is better than transporting someone to the hospital yourself because EMTs administer medical care immediately, en route, and have a fast-pass into the hospital treatment bay. This means most heart attack victims who call 9-1-1 have qualified medical attention much sooner than those who transport themselves to the hospital. Never drive yourself to a hospital unless you absolutely have no other choice as you run the risk of having a full cardiac arrest while driving, endangering yourself and other drivers. Unless the individual has an aspirin allergy, or has been advised not to take it, they should chew (not swallow) a dose immediately. Studies show chewing aspirin helps get into the bloodstream faster. Heart attacks are caused by a rupture of cholesterol-laden plaques in the artery, and this rupture triggers the immediate attention of blood platelets. Unfortunately, these platelets cause blood clots, which further block the artery. Once aspirin is chewed and swallowed, it takes effect in as little as five minutes. Studies also show that smaller amounts of aspirin work better than larger doses. This is why it’s emphasized to administer a single dose. If the individual has been prescribed nitroglycerin, make sure they take it with the aspirin. Never take anyone else’s nitroglycerin as that can do more harm than good. The “sit and wait” game is never easy, but that is exactly what you need to do as long as the patient is conscious and breathing. Encourage him/her to take slow, relaxed breaths and help them remain calm. If the individual loses consciousness, begin assessing for breathing and a pulse. If hr or she is not breathing and there is no pulse, begin CPR. If you do not have CPR training, call 9-1-1 again and ask for verbal guidance. The dispatcher will lead you through the motions of rescue breathing and/or chest compressions. Compressions are administered at a rate of about 100 to 120 compressions per minute. Is there an AED on-site? In public buildings, AEDs are usually mounted on a wall with visible signage. You can also delegate others to spread the word and see if an AED is anywhere in the vicinity. If so, instructions for use are written on or inside the device or its case. Most AEDs will “talk” you through each step. Either way, AEDs are very easy to use and can significantly increase the chances the person’s life will be saved if defibrillation is needed. Once EMTs or hospital personnel take over, you can breathe deep and know you’ve done all you can to save a life. Whether it’s for yourself, a loved one or a stranger, everyone should know the symptoms and proper steps to take in the event they or someone else is experiencing a heart attack. Pay attention to your body, and don’t wait to get help or call 9-1-1.